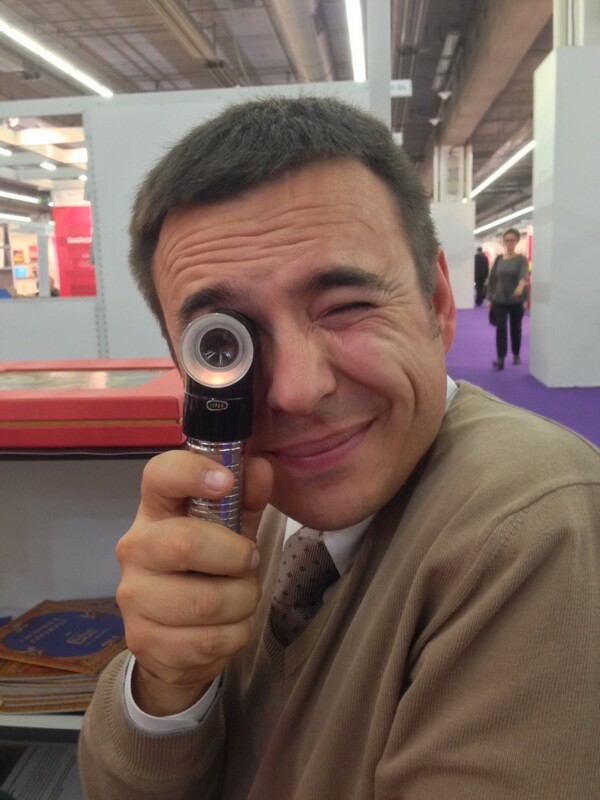 It’s the 4th year in a row that I don’t miss the most interesting and amusing gathering of the facsimile industry – and here I am again, at the Frankfurt Book Fair 2013! Frankfurt is always very welcoming and, after waking up this morning at 3 to catch the 6 o’clock plane, I indeed enjoyed a good rain shower – just off the plane! I arrived at the fair ground just in time and had a quiet walk through the booths – even before most publishers were there! From 9 on, it was one meeting after the other. 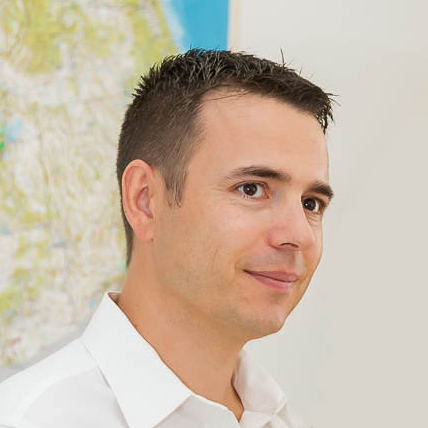 I’ve seen so many new editions – great stuff! Franco Cosimo Panini, for example, announced the Codice Varia 124, from the Biblioteca Reale in Turin. The production quality of this edition is amazing, with embossed gold that looks so real, and blues and reds that are simply breathtaking. 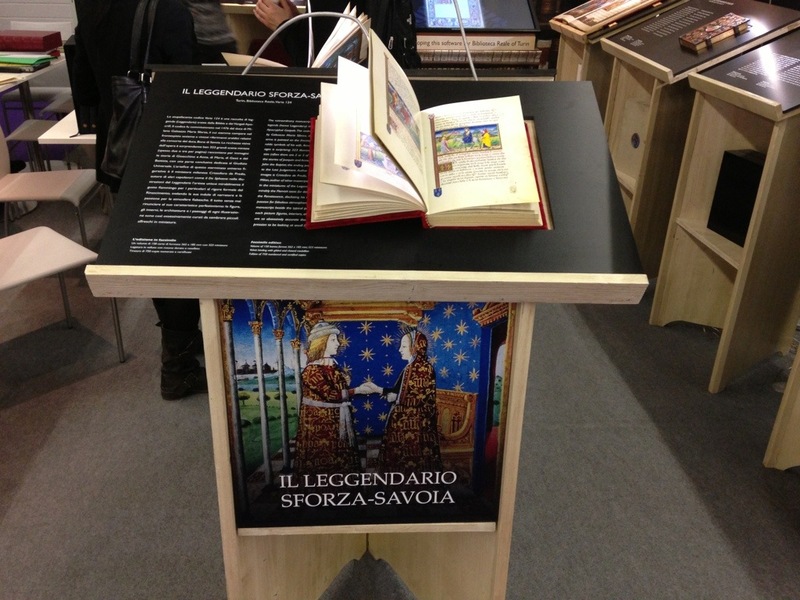 ADEVA had the brand new Liber Scivias on display: it’s a remarkable edition that I very much enjoyed to see. Liber Scivias, by Hildegard von Bingen. Facsimile edition by ADEVA. 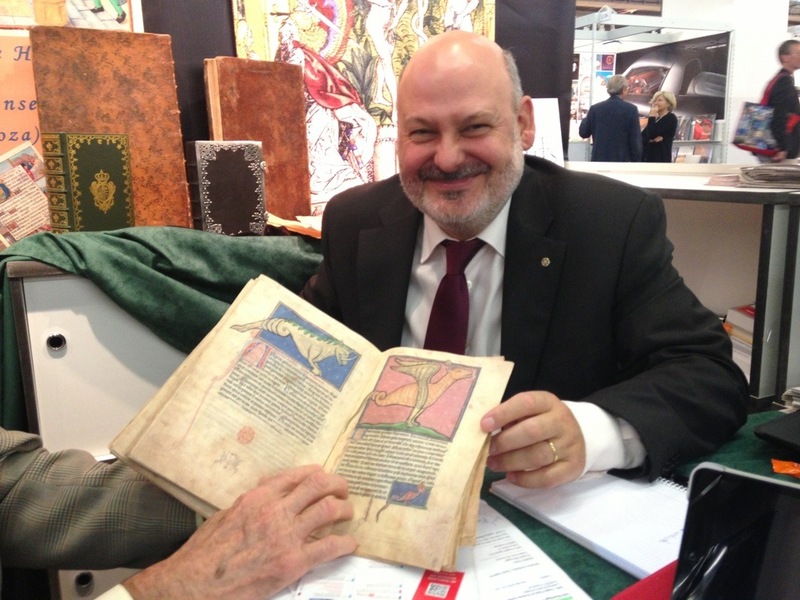 The Spanish publisher Siloé (featured in this photo is the super nice Juan José, one of the two owners) showed me two masterpieces that are being produced right now: the Hours of Luis de Laval and the Westminster Abbey Bestiary. You’ll hear more on the Bestiary later this year, as I think it’s a great facsimile that needs your attention. 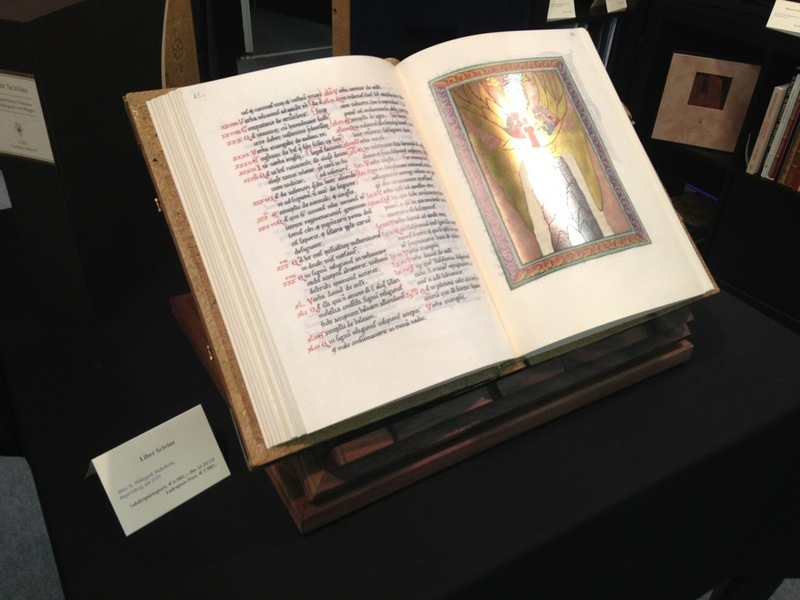 The publisher at Siloé shows the Westminster Abbey Bestiary facsimile. 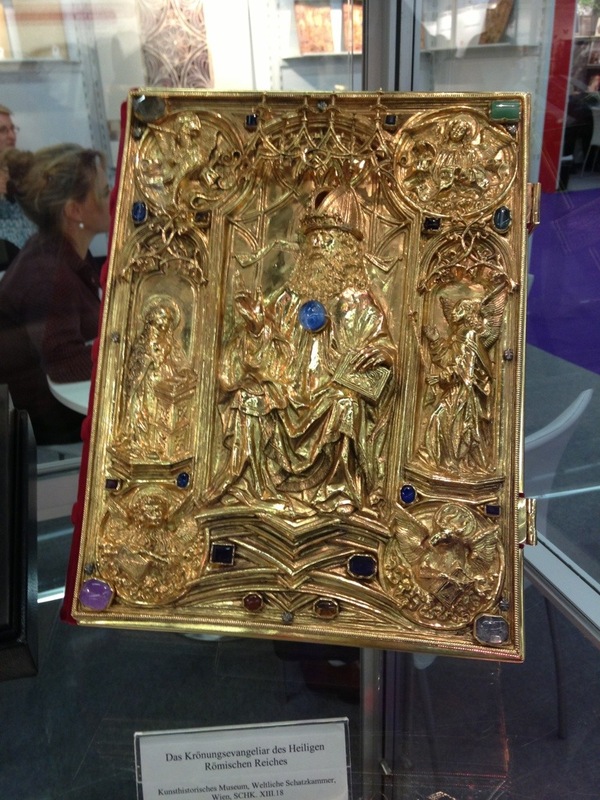 Faksimile Verlag showed me their latest production: the majestic Vienna Coronation Gospels (see that binding? It’s just what you need for a manuscript intended for Charlemagne) and the tiny Van Damme Hours. 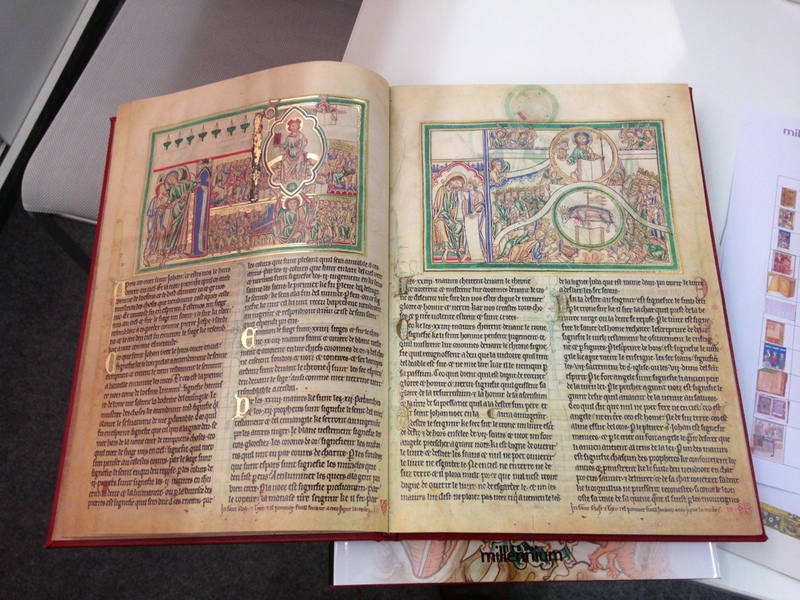 The Vienna Coronation Gospels is the new stunning edition by Faksimile Verlag. 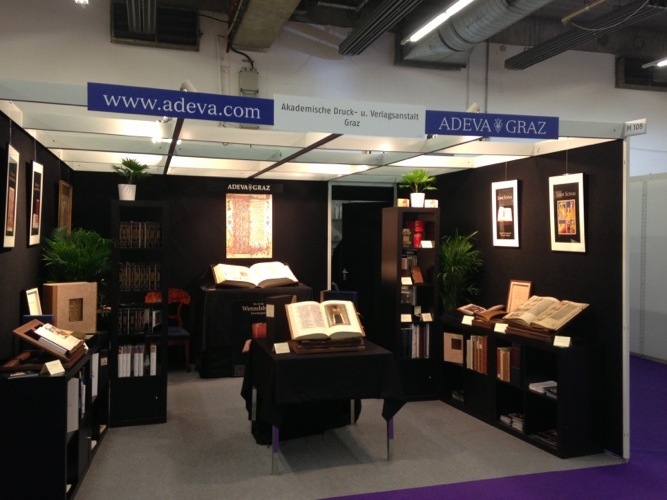 And at the end of the day – it’s a peculiar feature of the facsimile publishers at the fair – it’s party time! Each year, some of them offer their specialty to the colleagues, who enjoy some relaxation at the end of a hard working day. 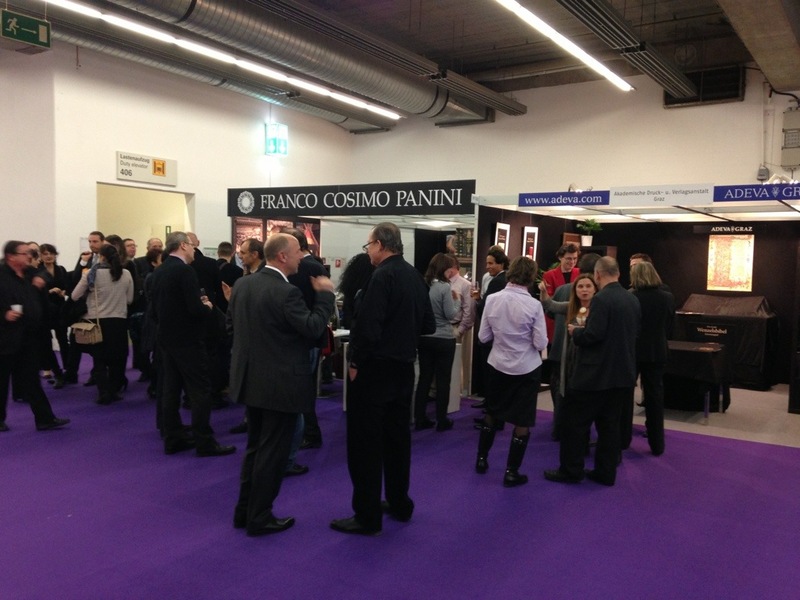 Today we enjoyed Swiss and Italian specialties. Quaternio offered their AMAZING Lucerne beer (it’s delicious, believe me!) together with some classic Swiss cheese; Franco Cosimo Panini contributed with Italian wine, Parmigiano and Balsamic vinegar from Modena (real stuff, aged a few decades!). Can’t wait to see what’s on for tomorrow! The second day at the Book Fair for me started in Hall 8, the international pavilion. There I visited a number of Museum Presses (British Library, MoMA, Getty, etc.) because – hey, you probably didn’t know this – I represent a skillful printer of art books and facsimiles. This is great news for all of you, facsimile lovers: the knowledge I’m acquiring in this new endeavor will benefit you greatly, as I’ll explore a number of secrets of the facsimile industry in a few upcoming posts. After the morning in Hall 8, I headed back to Hall 4.1: Art Books. There I met with Jorge and Alberto, publisher at Millennium Liber. They showed me two newly published edition which immediately caught my attention: the Apocalypse of Paris and the Berlin Beatus. The Apocalypse of Paris, facsimile edition by Millennium Liber. 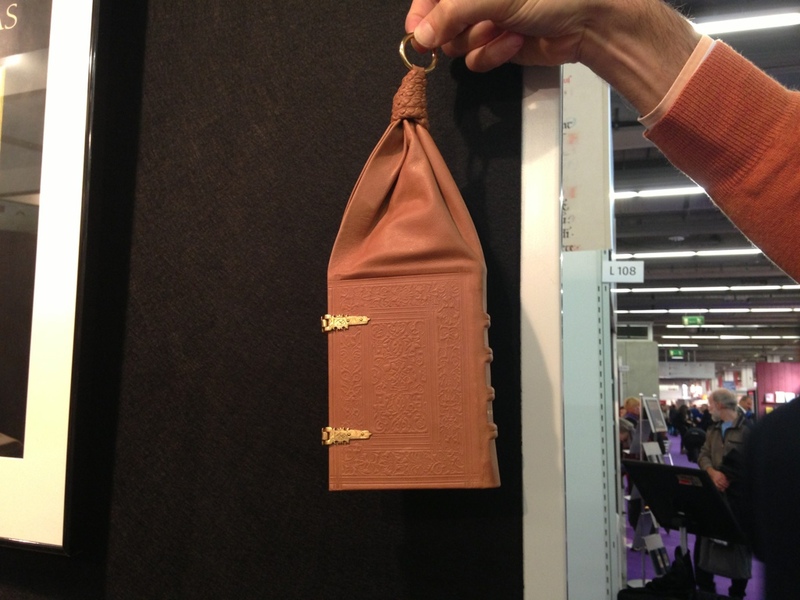 Paul Struzl, owner of ADEVA, showed me the only girdle book (Liber Precum) ever published as a facsimile. The only girdle book ever produced in facsimile. Only 60 copies, by ADEVA! The afternoon passed quickly, with a number of meetings with antiquarian booksellers. I kept the very last a meeting with the nicest couple of the facsimile industry: Charlotte Kramer and Javier Zalve (Mueller&Schindler and Eikon Editores). They also hosted the party on Friday: delicious “jamon iberico” and “queso” were the perfect closing for an always surprising Book Fair! So, dear readers, another year in Frankfurt has gone and your attentive reporter has collected a number of great news for you. You’ll hear more during the year and don’t worry, I’m always on the lookout for you! I’m always on the lookout for you!